My first experience with four wheels under foot was the ever popular set of skates. My first pair had a key that made it possible for the skate to fit your shoe ever so tightly. There were two little side pieces on each side of the toe area and a leather strap to go around the ankle. The size could be adjusted in length and width. I guess this was my first introduction to "one size fits all". (That would prove to not be a good thing later in life.) Now, it was possible for the toe pieces to come loose and the front part of the skate would flop around making travel difficult and since there was a leather strap around the ankle, a fall usually ensued. Lots of scraped knees and stumped toes....fortunately no broken bones. Cracks in the sidewalk made for a bumpy road, but that never deterred the kiddos that had a need for speed. In all of my skating years, I never delivered meals on wheels, although it was one of my dream jobs to be a car hop at the nearby Cre-Mel where they delivered a frosty mug of root beer and a greasy hamburger to your car. They skated their way around with a tray ever so balanced in one hand held high overhead. What gracefulness and poise. But.....2008 was the year of meals on wheels. Let me explain. I created the meal and I put on my skates got in my car and delivered my creation. My sister is a widow so her nest is really empty and our nest is empty , except that the front door has been revolving for several years now and that is OK...there is no place like home. It is difficult to cook for just one or two after so many years of family dinners, so I had this great idea that if my sister and I each cooked one main dish on the weekend and shared half of it with each other, we would have two different meals...more when there are left overs....for the price of one. WOW! It worked and for one full year we cooked never repeating a single recipe. Two meals fed her for the week with a little addition here and there. It certainly helped at my house too. We had fun surprising each other. Not only did I take the food to my sister, but I stopped by my 90 year old mother's house and left her a portion of whatever I had cooked. Nothing we made was of the gourmet venue, but good ole home cooking. Although not the traditional "Sunday Dinner", I will call them by that name. 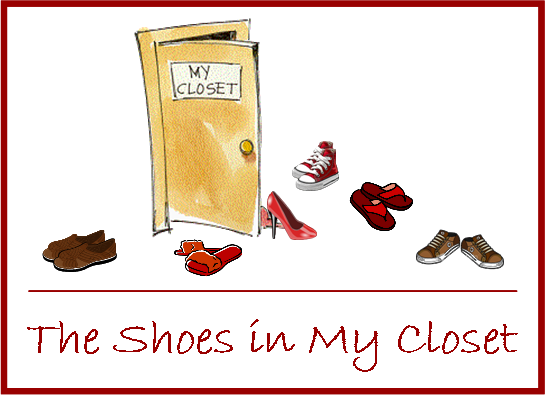 I will share with you every Sunday another pair of shoes recipes from our closet collection. We were honest with each other about our likes and dislikes, so I will share that with you also. Here is the first "Sunday Dinner". Boil 6-8 boneless, skinless chicken breasts. Save the broth for dumplin's. I have found that the best way to boil chicken is in the crock pot. Place chicken in the crock pot and cover with water. Cook on High for 3-4 hours or on Low for 6-8 hours. The broth is very clear this way. Mix ingredients. Roll out to 1/4" thick and cut in 1" strips. cut each strip into 1" squares. Drop in boiling chicken broth. Simmer 20 minutes. Let stand 30 minutes before serving. Add salt and pepper to taste. Cube chicken breasts and add to dumplin's. Enjoy! Put soup in bottom of 9X13 baking dish. Add meat, onion, and mushrooms. Place foil on top. Bake 3 hours at 400 or 4 hours at 350. Your house will smell like you were in the kitchen slaving over a hot stove all day, but that will be our secret. I hope you enjoy these tried and true recipes. Let me know what you think! If the skate shoe fits, wear it well! that beef casserole sounds good! Amber did tell me! That's so funny! She told me a few other things about her too, but we won't mention those! haha!!! First and foremost, I am a daughter of the King of kings. I am a wife, mom to 2 adult sons and 1 adult daughter, stepmom to 3 adult sons, mother-in-law to 1 son-in-law, and Mimi to 2 precious granddaughters and one grandson. I am a Jill of all trades....quilting, sewing, crocheting, decorative painting, wallpapering, wall painting, furniture reupholstering, furniture refinishing, tatting, embroidering, bow making, cake decorating, well...you get the idea. I have been a first day of school mom, a baseball mom, a soccer mom, a gymnastic mom, a mom with cancer, a sick child's mom, an ICU mom, a first time driver's mom, a mom of the broken-hearted, a broken-hearted mom, a football mom, a drill team mom, a leaving the nest mom, a bound for college mom, a coming home from college mom, a mom of the bride, (someday a mom of the groom), a grand-mom (Mimi), and occassionally a mom to my elderly parents. When I grow up, I want to be.....get the picture?